With work and much rescue involvement these days, I don't gt to check in often anymore, but I think often of you and yours. I did just peek in at Jeff's story of Pekoe's stroll and had to laugh. I'm glad it turned out OK. 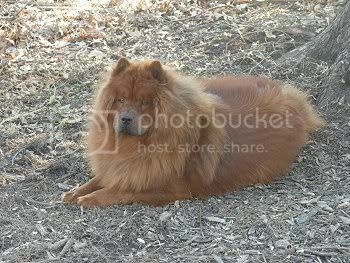 Here in Nashville, Tennessee, there is a beautiful red Chow gentleman (would remind you of M&M if you saw his picture) whose owners had him for years, kept him beautifully-groomed, and bragged about his looks to the neighbors. A few weeks ago, unaccountably, they moved away, leaving Bing outside alone. He waited several days for them to come back. Finally the neighbors intervened, and now he is staying in a very nice kennel, waiting to find a home. Unfortunately, he is grieving his old life and the treachery of the so-called friends he wasted his Chow loyalty on. For many days he didn't eat, and the kind people who took him in began to think the best thing for him would be euthanasia. Luckily, the vet was closed that day, and he did begin to eat a little. He is now eating some but not enough and is still very sad. Because of that, he is still in danger of being PTS. He needs to go into a home, not into rescue. He lived peacefully for many years in a quiet home with other dogs. I have pictures and can find out anything else if anyone can find it in their heart to give him new reason to trust people. Transport can also be arranged but I a relay through many hands over a long distance will probably not be in his best interest. Please pass this along to all Chowists who might help, and keep this gentleman in your hearts. Email me directly at susanheard@paradigmgroup.net or call 615.512.5851 if you want to get involved in the effort to save Bing. PS - The herd and all its members are doing fine. Our oldest, Calico Cat, passed away in January, peacefully, of old age. We miss her but know she had a full life. Susan, for God's sake how does somebody do that? Please God, he finds a new home with someone to love him - I cannot bear to even try to think how he feels. Glad the Heard Herd are well. Lovely to hear from you. I just don't understand why they would do that... just leave him outside alone. <sigh> Do you happen to know how old he is and do you mind if your post is cross posted? Also do you have any pictures and know his size? Re: "He is now eating some but not enough and is still very sad. Because of that, he is still in danger of being PTS." That level of stress can easily shift his chemistry into destructive metabolism: anorexia, depression, etc. He needs potent B-complex at least, to reshift this destructive chemistry. The B-complex stimulate appetite, help build serotonin (calming brain chemistry), nourish the adrenals, act as a counterbalance to stress, are involved in energy production, and protect the immune system, etc. etc. etc. It's shocking and heart breaking just reading about what was done to him! What a heart breaker! I tried to email you but it was bounced back to me due to "firewall" protection. I'm sure it's my work email that is causing the problem. I would like to help if you need transport assistance. I will PM you with my information! I'll cross my fingers for him! Susan, do you think it might be possible He may have wondered off form the new home and came back to the old home? Its hard to believe that people could be that heartless, actually its not hard to believe but there's always hope. You said they kept good care of him, maybe they are looking for him. I sent this to the rescue that helped me set up fostering Fancy and Leia and she already had someone asking for more information! I hope that means good things for him! I hope so too. I really believe that he was not eating due to grieving the loss of his owners (WHY WHY WHY would they do that to him???). When we go away and my parents take care of Bones, he does not eat for a few days, not even treat bones! I am so saddened for this old gentleman dog and would take him if he could get to Calgary (and my husband agreed), but don't think it would be possible as I am so far away and in Canada. This came across an email list I'm on. Here is one of the photos they sent of this guy .. I just can't understand why anyone abandons their dog. Oh dearie me, he is beautiful. I see what you mean Susan - he is very like Milly and Mabel isn't he. And beautifully groomed too - why on earth abandon him. Wow! He could be my Jaspers twin! (see my post on rescue forum). Recently a friends' next door neighbors moved away, and we knew they took the dogs with them. 3 days later, who do we see but their little Chow mix dog on the porch. Unfortunately they didn't have an ID tag on her, nor did anyone know how to reach them. We put out food and water for her and she was gone a day or so later. Presumably she either went back to the new house, or they thought to come and look for her. County tax records are usually online and may help track down the owners, or the landlord if it's a rental house. They don't sound like the type to dump a dog. Maybe they had financial problems and gave the dog to someone, the dog ran away, and they don't even know. Because owning just one banned breed isn't enough! -- Rest In Peace Jasper the Chow Chow & Lucy the Pit Bull. He is beautiful!!! He sure is well taken care of for just being left behind. I am beginning to wonder also, if he hasn't escaped to his former home too. I just can't imagine anyone abandoning a beautiful chow like that, especially up until then they were taking such good care of him. But then again, at this point, nothing surprises me. There is just NO way to track down the former owners??? Surely they left a forwarding address at the post office? Ooh! Good idea. You can mail a letter to the old address, and if they forwarded their mail, it will go to the new one. Sometimes, this can take a couple of weeks, however. What a great looking dog! I feel so bad for him. I wish I was in a postion to help. I read Susan's post about this situation on Monica's Chow site. The owners left the Chow with a note saying there wasn't enough room in the truck and that the neighbors could do what they want. It's unthinkable that anyone would be so cruel. They had this Chow since he was a puppy - for nine years. I do hope he finds a loving home soon. I hope he finds a good home soon. please don't let them put him to sleep... no matter what. He deserves better than that. I don't think he would do well in a rescue either because of his age, and right now he needs some serious one on one love. Mandy knows how to get ahold of me and if it has to be, I'd be willing to at least foster him before I'd let him be put to sleep. I have a 5 month old male chow pup here already, so I don't know how Bing would be with him, but I'd sure be willing to try to be able to save him. Like I said, Mandy knows how to get in touch with me, or PM me and I'll contact you. Oh Nancy! I'm so glad you'd be able to take him in as foster! As I said before, I would be more than happy to transport and I would able to get him from the illinois border to Nancy if you need me to. Nancy, it may be best if you shoot her an email directly. That is how I got ahold of her and she responded quickly. I'd be more than willing to adopt him.. If I wasn't an ocean away..
Me too - if we didn't live over The Pond. This story just haunts me. The stories about dogs being abused and chained up etc. are bad enough, but at least those dogs know the score. This poor boy must be so confused. I would love to have him - he is as Susan said, so like M & M.
I just pray he gets someone to love him and that he can get to love again. I just shot her off a quick email. I appreciate the help in transporting. I'd not trust my car all the way to get him. I just don't want him put down and if I have to choose between fostering and him being PTS, I'll foster. That old gentleman deserves alot better. Just a quick update. I did hear from Susan. Bing is NOT in any danger now of being put to sleep. He has begun eating and starting to wag his tail. They do have an interested paty in NJ for adoption, so at this point, they are waiting to see if that pans out. She will let me know if he needs to be fostered for awhile. I just wanted to let everyone know hw he is doing. Thank you Nancy - that is good news. I hope it works out and he gets someone to love him. This group is awesome! I stupidly forgot to check back once I posted and now I see 22 responses. The good news: we do have two adoption offers and several foster offers. Bing will not be put down! The people who even considered that we just thinking of his suffering, not realizing that Chows have loyal hearts and long memories. We are carefully screening Bing's options and readying him for adoption (he needs a HW test and a rabies shot, and possibly dentistry. After Katrina, I am committed to microchipping, too.) The closest offer (it would take just 3 transport legs) is an experienced Chow person, which is what I hope for Bing. Now the bad news: No chance that Bing got away, was left accidentally, etc. These people are just $#%@#$% jerks. They left him intentionally. They also released a 15 year old pet bird into the 30 F weather, condemning him to death in just hours. I am doing what I can to track them down and have them charged under Tennessee and Metro Davidson County cruelty and abandonment laws. Unfortunately, this happens all the time, but usually it's to some poor dog who had already spent his life chained in the backyard. No matter that the dog is crazed with hunger by the time someone realizes what has happened. Such cowards won't even take the trouble to turn their dog into Animal Control where maybe they can be adopted but at least will have a humane death. I appreciate all the heart you all have shown and now want you to rest easy for Bing. Keep your eyes open, though. So many more like him are out there needing our help. I am so glad he is going to get a wonderful home!! That is EXCELLENT! I feel so bad for the poor bird. Let us know if you are able to prosecute them. People like that will have their day. Shame on them. Bing deserves better, maybe this is a blessing in disguise?